News: Results from Challenge Roth and IM Frankfurt, There might be a new event for Auckland, IM Switzerland is coming up, Man to attempt 50 IMs in 50 states over 100 days. 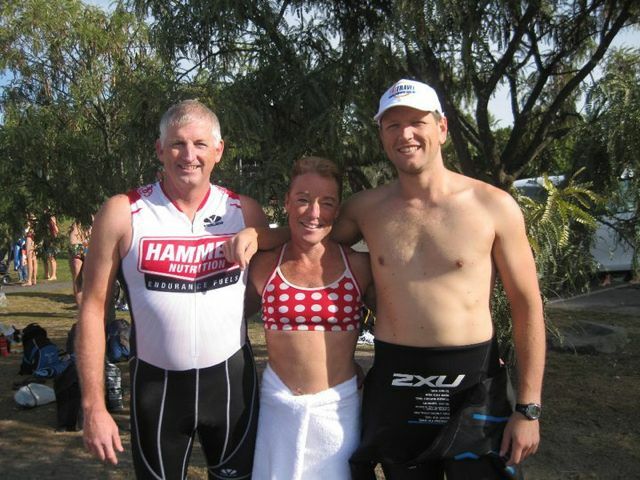 This Weeks Photo: Matthew Binns sent through this weeks photo with him, in the Hammergel gear, Lisa Harding (last weeks AGOTW) and Clownboy at Ironman Taupo. The team are looking sharp. Age Group of the Week: Jade Garrett sent through her boyfriend Nathan Bradford for this weeks age grouper. Nathan has been working hard over the years to keep improving and Jade said that she was impressed with how focused he is. This focus paid off in the Outlaw Triathlon where he managed to get 3rd overall in a time of 9:26. Well done Nathan. Coaches Corner: In this weeks Coaches Corner John talks about if you need to have a day off every week. He then goes on to talk about an email that Marion 'Moose' Herring, MD sent through about Stress Fracture Treatment. This Weeks Websites: Olympic Marathon qualifying times, 50 IMs guy, Dave Scott Webinar on Training Peaks, Long history of the Espresso Machine, Hot Dog champ, Brian Rhodes.